Lemax Reverend Smythe Figurine depicts a Reverend clutching the Bible awaiting the arrival of worshippers prior to a Christmas service. Ideally placed in a Lemax village setting outside a Church doorway. 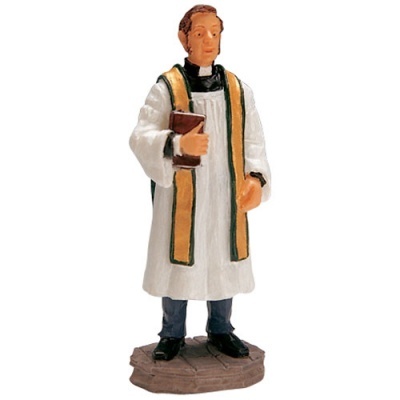 Reverend Smythe has been enjoyed as a Lemax Village scene figure since 2002, and still going strong! Reverend Smythe is a single individual hand painted polyresin figurine mounted on a single base to compliment your seasonal Lemax Village Christmas display. Very pleased with my purchase. Perfect in size for what I needed this item for.